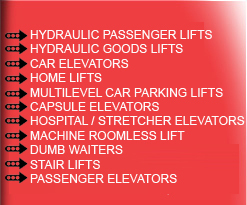 Manufacturers of : Hydraulic Lifts | Hydraulic Passenger Lifts | Home Lifts | Hydraulic Goods Lifts | Car Parking Lifts. 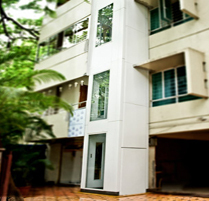 Being in the field of vertical transportation for over a decade we manufacture all kind of Industrial Lifts, Passenger Lifts, Goods Lifts, Capsule Lifts, Hospital Lifts, FlameProof , Dust Proof Lifts, Hydraulic Lifts. We follow a fundamental principle of ensuring quality and safety while manufacturing, erecting and maintaining Lifts and Elevators. We source optimum quality mild steel and stainless steel, that is a well known in the industry. We also use micro process controlling system and finolex cables to ensure the safety and durability of our Lifts and Elevators. Moreover, we have setup a well developed quality testing unit, which is managed by highly skilled quality auditors. These quality analysts stringently inspect the whole production process and test the quality of our lifts and elevators on various parameters .